Lucky Creek Casino is awesome. I have a strong love for casinos that have a Wild West-style theme, and the fact that this casino has an excellent mobile backbone makes this a must-play in my eyes. But what makes Lucky Creek Casino so great to play on your Android device? I have a lot of reasons to explain to you below. 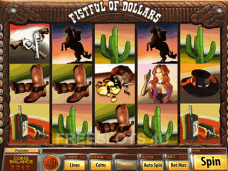 When I first made my way to Lucky Creek’s mobile casino on my HTC Droid DNA I was met with an excellent Wild West-style theme that formed perfectly to my phone’s five-inch screen. This is always an excellent indication that the casino knows what it is doing and that the casino experience on your Android will be better than many other casinos, where the mobile experience is an afterthought. I ended up having to register an account before I could begin my casino review and thankfully Lucky Creek makes the whole process as simple as possible. I was able to complete my registration within two minutes while typing in all of my personal information, which is pretty good considering that the Android keyboard isn’t the best in the business. After getting my account confirmed, I was set to move on to the deposit process, where I would deposit $100 and get myself rolling. 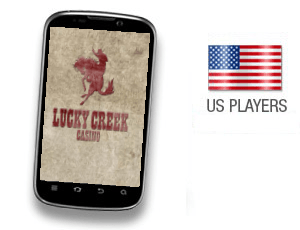 When it comes to the deposit process on Lucky Creek’s Android casino, the options are limited for players hailing from the United States. Being a Yankee myself I was only able to deposit through my Visa card. Punters from other countries will be able to deposit through the likes of UKash, UseMyWallet, Giro Pay, iDeal, and PaySafe Card. My Visa deposit was instantly credited to my account, which was very nice to see on my Android device. I have often times seen my Android casinos reject payment and thankfully this was not an issue at Lucky Creek. Seeing as how this was my first time playing at Lucky Creek Casino, I was eligible for a very nice 100% match bonus up to $500. I ended up putting in $100 through my Android device and found that my mobile bankroll was instantly doubled to a $200 level. This is a pretty generous match bonus and while it doesn’t reach the 200% level we have seen at some spots, it is way better than some of the Android casino bonuses we have seen, that can be as low as 50%. The games at Lucky Creek Casino’s Android casino are fantastic. Powered by BetOnSoft, the casino is specifically tailored for mobile devices and I am thrilled with the slots that I played here. I really enjoyed the smooth animations of the slots, while the bright graphics and loud game sounds really translated well through my Droid DNA. 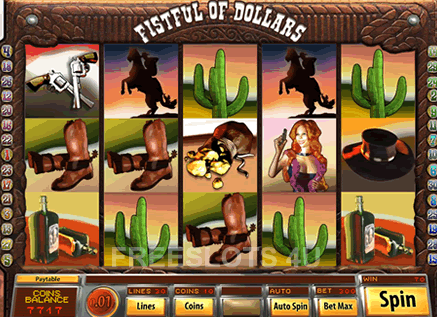 I had no problems with the mobile casino’s touch screen whatsoever and found that almost every game was a real delight to play. If you are looking for the best selections here, I have to recommend Reef Encounter with its Finding Nemo-esque theme as well as Small Soldiers, which is a great take on the charm of the developers at BetOnSoft. In the future, I would really like to see Arcadia i3D ported over to the Android casino, as I feel that unique games like this really could make this casino something even more unique. Video Poker isn’t my favorite game, but there are several varieties of the genre available here. I did like the various “Wild” games on my Android smartphone and I really like the way they played with the touchscreen here. I am pleased to see the newest addition, Rival Software, added to the games providers repertoir. Any casino worth its weight should at least offer Blackjack and Roulette and seeing Atlantic City Blackjack, European Roulette and Punto Banco, makes me really happy. After playing a few days at Lucky Creek, I was ready to pull my money out. I ended up having to move over to my PC in order to submit some identity documents, but I was able to select my withdrawal option through my smartphone. I ended up selecting to receive a paper check from the casino, which was shipped to my house through FedEx. Other options for payment include Bank Transfers and Credit Card refunds. If you live outside of the US, you can also get withdrawals through UKash, Skrill, and EcoCard. I waited about 10 days from requesting my money to actually having it arrive at my house. While this isn’t the fastest I have ever gotten my money, I was quite happy with the speed in which it came. While waiting for my money to come to me, I ended up chatting with customer support twice on my smartphone. Punters hoping to contact customer service can call their phone number or initiate an instant messaging session. I opted for the latter and found that the staff was quick to pick up and pretty knowledgeable regarding the banking process. Even when the reps I dealt with didn’t know the answer to my query, they did work to get a hold of someone who could answer it for me. I was impressed by this, as many times customer service at casinos don’t care to do the extra work to make sure the customer is happy. Lucky Creek Casino does a bang up job in this regard. Overall, I feel that Lucky Creek is an excellent Android casino that I am happy to keep visiting while on the go. I really liked the games and customer service here, as well as the great Wild-West theme. While the casino could do a better job of getting more banking options, Lucky Creek’s Android casino is a very good spot to play.